Antique solid mahogany chest of drawers. 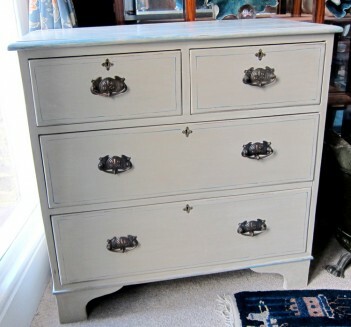 This has been painted using Annie Sloan paint in Country Grey, which is a beige colour. The detail has been picked out in blue. The chest of drawers has then been sanded to distress it and show the colour painted underneath, then waxed to protect the wood. The handles are original, as are the key escuthens which are nice detail that is not common on all furniture of this type.